Varuna, 40-Rater. Mr. J. A. Mulhall. Designed by Mr. G. L. Watson in 1892.
of Dragon, she was champion of the fleet. Mr. Towers-Clark then commissioned Watson to design and Messrs. Henderson of Glasgow to build the Varuna. The yacht was a favourite with her designer, but she was outclassed by the Watson boat Queen Mab in 1893. When Queen Nab was withdrawn from the class, Varuna won twenty-three prizes out of forty starts. After selling Varuna he bought Lorna, 90-ton cutter, which he used for cruising. 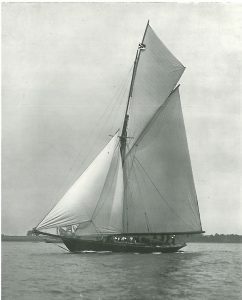 He was an original member of the Solent one-design class, and built the C. Lark, which he raced for four seasons, during which time he lived on board the Lorna. Having dis­posed of the Lorna, he gave up yacht-racing, but he is still keenly interested in its welfare. Clubs: Royal Yacht Squadron, Royal Northern, Royal Clyde, Royal St. George, Castle. Resi­dence: Coton Hall, Sudbury, Derby. Biles, Professor John Harvard, LL.D. Brassey, Major the Hon. Thomas Allnutt, M.A. Brazier Creagh, Lieutenant-Colonel George Washington, C.M.G., R.A.M.C. Breadalbane and Holland, Marquis of, K.G. Bulkeley, Sir Richard Henry Williams, Bt. Burt, Sir John Mowlem, Kt. Champion de Crespigny, Sir Claude, Bart. Clayton, Lieutenant-Colonel FitzRoy A. T.
Crawford and Balcarres, The Earl of, K.T. Crichton, Colonel The Hon. Henry George Louis, A.D.C. De Horsey, Admiral Sir Algernon Frederick Rous, K.C.B. De Ros, Lieutenant-General Lord, K.P., K.C.V.O. Dunraven, The Earl of, K.P. Eady, Hon. Mr. Justice Swinfen, LL.D. Finlay, David White, M.D., LL.D. Fitzgerald, Sir Robert Uniacke Penrose, Bart., D.L., J.P.
Forwood, Sir William Bower, K.B., D.L. Greene, Sir E. Walter, Bart. Guinness, The Hon. 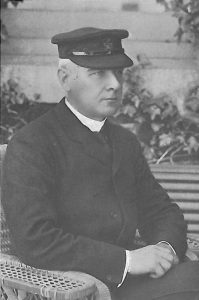 Rupert Edward Cecil Lee, C.M.G. King, Sir Henry Seymour, K.C.I.E. Leach, Colonel Sir George, K.C.B. Lechmere, Sir Edmund Arthur, Bart. Lipton, Sir Thomas Johnstone, Bart., K.C.V.O. Manning, A. G. S., sen.
Newnes, Sir George, Bart., M.P. Newton, Dr. Henry W., J.P.
Orr-Ewing, Sir Archibald E., Bart. Parsons, The Hon. Charles A., C.B. Pasley, T. H. S., M.V.O., fourth class. Quilter, Sir W. Cuthbert, Bart. Redwood, Sir Boverton, D.Sc., F.R.S.E. Rosebery, Earl of, K.G., K.T. Ross, Sir Charles Henry Augustus Frederick Lockhart, Bart. Scott, Sir Samuel E., Bart. Sinclair, The Right Hon. John, M.P. Smiley, Sir Hugh Houston, Bart., D.L. Strathcona and Mount Royal, Lord, G.C.M.G., F.R.S., LL.D., D.C.L., P.C., D.L. Thornycroft, Sir John I., LLD., F.R.S. Watson-Kennedy, Lieutenant-Colonel T. F. A.